I have this recurring fantasy where I fly home for the holidays, pull up to my childhood home, and fish my bags out of the trunk amidst a light snowfall. The warm glow in each window a flickering neon "vacancy" sign after a long stretch of flight delays. Floating into my old room, it's exactly how I left it in 1999. The plastic trophies, acoustic guitars, foosball table, love notes, and trading cards—all waiting for me like old friends. Here, the 17 year-old me never ages, immune to the years, months, and days. Weezer's Blue Album is on compact disc while My So-Called Life reruns (I secretly wanted to be Jordan Catalano) flicker on my television. Time just…stands. The reality was something different altogether. While I spent the entirety of my boyhood under one roof, my little brother took up squatting before the Sharpie could dry on my college boxes. The shrine of my adolescence brought low in a single afternoon. Hardly tragic in the moment. But, as the years pass, the nostalgia cakes thick like the old dust that should have donned such an alter. The museum of a suburban adolescent left only to exhibit in the recesses of a thirty-something's fading memory. Giovanni Boldini oil on canvas portrait of Marthe de Florian that later fetched 3.4 million at auction (a record price for the 19th century Italian artist). 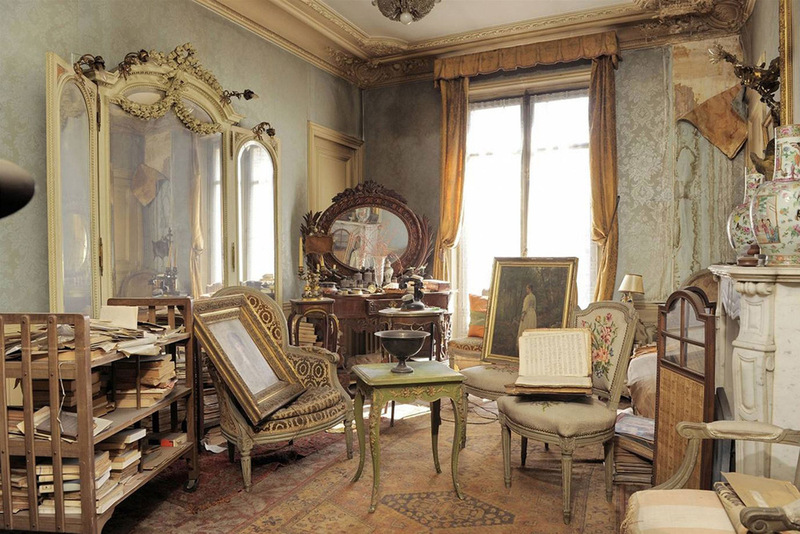 Imagine the relapse of my golden age syndrome when the “Untouched Paris Apartment Discovered after 70 Years” news broke earlier this year. Abandoned during the second great war, the opulent flat belonged to the granddaughter of the late Parisian socialite and actress Marthe de Florian. She fled for the south of France to avoid the Nazi raid. She’d never return. The discovery came at the hands of her executor after she died in 2010. Under lock and key since 1939, rent diligently paid, and left utterly untouched, the 9th arrondissement flat is literally a Parisian time capsule. A stuffed ostrich, lavish heirloom furniture, Persian rugs, and a scad of oil paintings were among the inventory taken. Among the gems unearthed from the strata of dust, a Giovanni Boldini oil on canvas portrait of Marthe de Florian that later fetched 3.4 million at auction (a record price for the 19th century Italian artist). However, the real find lies inside the love letters exchanged between Boldini and his subject. That's what time capsules should be, as rich in secrets as it is with possessions.